I am big fan of home fragrances, candles being my favourite. Filling the room with fresh and pleasant scents, candles can transport you to exotic locations even if you are sitting at home with the weather not playing ball. I love citrus based scents and spice based scents but am not a fan of sickly sweet artificial fragrances. That being said, I do love fresh and naturally sweet-smelling candles. And one such scent that is becoming a firm favourite of mine is the There’s Nothing Better Than a Friend, Unless It’s A Friend With Wine Candle! It is a Bordeaux Fig and Vetiver candle from IJustLoveIt.co.uk. Made from 100% natural soy wax blend and with up to 40 hours of burning time, the luxury candle has been hand poured in the UK and comes in a beautiful green glass holder. The label reads 'There’s Nothing Better Than A Friend, Unless It’s a Friend with Wine'. The candle comes packaged in a lovely gift box and would make a wonderful gift for your best friend. This is the first time I have used a Vetiver candle and I loved it. The fragrance is a combination of the sweet, rich notes of Fig with the fresh and earthy scent of Vetiver. It is a pleasant scent - not overpowering but strong enough to scent a small room. The candle burns nicely without any tunnelling and the scent lingers even after the flame has been extinguished. A beautiful fragrance and definitely a wonderful gift. A wonderful selection of scents, isn't it? Would you like to win one of these candles? Enter using the Gleam widget below and the winner will have the choice to pick any one candle out of the new range. All the best! *I received the candle to facilitate this review. I was not paid for the review and all opinions are, as always, my own. Pomegranate and Raisin for me! I would choose the Unplug... Uncork... Unwind Candle/ French Cedar Wood Fragrance because I usually light candles in the evenings to help me relax and I love woody fragrances. I'd love to try the Birthday Wishes, Champagnes and Kisses Candle because I love Marshmallows, and I think I'd enjoy the sweet aroma. Unplug... Uncork... Unwind Candle/ French Cedar Wood Fragrance sounds lovely! Unplug... Uncork... Unwind Candle/ French Cedar Wood Fragrance - love woody fragrances and the name just makes you feel more relaxed! The prosecco one sounds right up my street! The Vanilla and Sandalwood sounds wonderful. I would choose when life gives you lemons make a gin and tonic... I live by this saying! I'd choose Unplug, Uncork, Unwind because that sounds like a good life motto! I like the vanilla and sandalwood candle as they are two of my favourite fragrances put together which I think would smell lovely. Toasted marshmallow - sounds delicious! when life gives you lemons, as it sounds fresh! So many gorgeous sounding candles, I would have to personally choose Love, Laughter and Prosecco Candle though as it sounds extra amazing! I'd choose Love, Laughter and Prosecco Candle/ Vanilla and Sandalwood Fragrance - sounds right up my street! I would pick vanilla and sandlewood as we love this combo! Birthday wishes and champagne kisses, it would be perfect for my mum. Cheers to the brand new Mr and Mrs. I love vanilla scents. I evokes cleanliness, calm and serenity for me so would love it! Love, Laughter and Prosecco Candle/ Vanilla and Sandalwood Fragrance - we love prosecco and vanilla, sounds perfect for us. 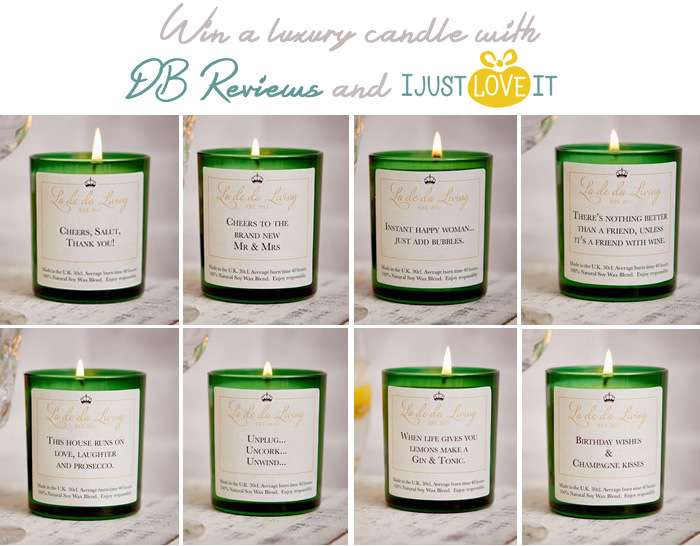 Love, Laughter and Prosecco Candle sounds gorgeous! Birthday Wishes Champagne and Kisses, I would choose this one because I love the smell of marshmallows. All the best to everyone who has entered. 5 days to go. Birthday Wishes Champagne and Kisses Because i Like Sweet Scents. I would choose the Vanilla and Sandalwood Fragrance - Love, Laughter and Prosecco Candle - sounds amazing! Love, Laughter and Prosecco Candle/ Vanilla and Sandalwood Fragrance would be my choice for two readons - 1. I love the sound of that scent & 2. It is the prefect saying for me! I prefer woody scents, so I'll choose the French Cedar Wood Fragrance. I'd choose the Vanilla and Sandalwood Fragrance as I really like both those fragrances. Love, Laughter and Prosecco sounds perfect for me lol! I'd choose the Unplug... Uncork... Unwind Candle - French Cedar Wood Fragrance because I need all the help I can get to try and relax! Unplug... Uncork... Unwind Candle/ French Cedar Wood Fragrance cos I need to unwind and it sounds like a fragrance I'd enjoy.